In our last blog we discussed the Queen Anne and Chippendale styles that were popular in America during the 1700s. Now we’re onto the next phase of American furniture history, the Neoclassical or Federal Era. The three decades that followed the formation of the United States are referred to as the Federal era in recognition of the early development of the national government. The style of houses and furnishings created during this period was heavily influenced by the Neoclassical designs favored in Great Britain since the 1760s, which stemmed from a renewed interest in classical Greece and Rome. The Neoclassical style varied from region to region but drew from common sources such as architectural designs introduced abroad then disseminated in America through various publications. The clean lines, delicate forms, geometric shapes, contrasting veneers, and decorative inlays of Federal-period furniture represent a dramatic shift away from the sinuous Rococo carving that had typified American decorative arts for the previous thirty years and found in period rooms from the second half of the eighteenth century. The best way to get an accurate representation of what this era held is to look at three famous rooms. 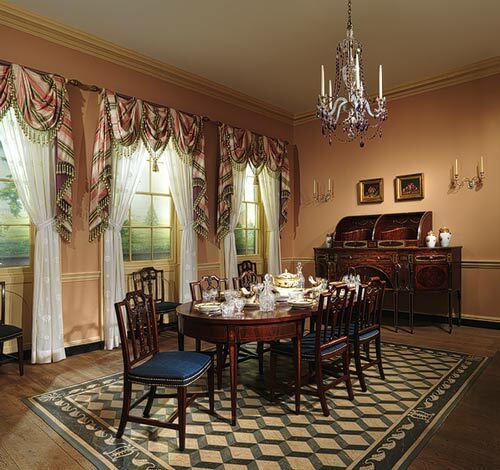 The Haverhill Room is from a house built for James Duncan Jr. in 1805 in Haverhill, Massachusetts. Financial success allowed Duncan to build an elegant house representative of the variant of Neoclassical style that prevailed in eastern Massachusetts. The delicate composition ornament and mahogany pilasters on the mantel are important signifiers of this architectural mode. There are also echoes of ancient Greece and Rome in such decorative motifs as urns draped with fabric, festoons of flowers, and Etruscan scrolls. This room comes from a townhouse built between 1810 and 1811 in Baltimore, Maryland for merchant and shipowner, Henry Craig. The geometric shapes found in the interior woodwork are excellent examples of the adoption and adaptation of the English Neoclassical style in the Federal period. Unlike the elaborate, fully paneled fireplace walls of eighteenth-century homes, decorative woodwork in the Baltimore Room is limited to the mantel, the door and window surrounds, and the dado in the recessed alcoves. All of the elements were crafted entirely from pine. Large two- or three-piece dining tables came into vogue in the United States toward the close of the eighteenth century. Unlike a bulky sideboard that tended to remain in one location, a dining table with drop leaves could be conveniently stored against the wall when not in use. The inlaid eagle in an oval reserve seen at the top of each table leg is a motif common to Baltimore furniture in the Neoclassical style. 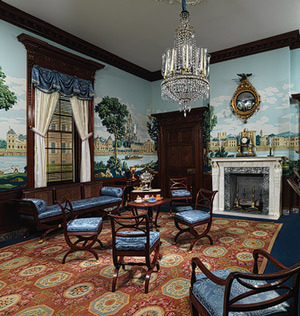 From a house built between 1810 and 1811 for the Richmond lawyer William Clayton Williams, the Richmond room’s most notable features are its rich mahogany woodwork and blue-and-gray King of Prussia marble baseboards. 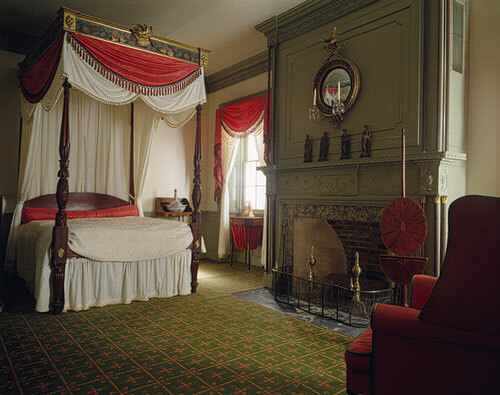 Most of the furnishings in the Richmond Room were made in New York City. The tables and seating furniture on view follow patterns in an archaeologically correct antique taste that superseded the Neoclassical style and was strongly influenced by French design. Furnishings continued to feature motifs from ancient Greece and Rome, but they were incorporated as three-dimensional elements such as carved wood figures or applied brass ornament rather than the two-dimensional inlay that typified the Federal style. The curule shape of the legs of the sofa and chairs—also called a “Grecian cross” frame—found in the Richmond Room is based on an ancient Roman magistrate’s folding chair. Formed by two intersecting S-curves, the curule appeared in many early nineteenth-century design sources and price books, which were the guides published to establish how much a journeyman cabinetmaker was paid to produce a particular piece of furniture. This room has been described as “a revelation to the creative taste and genius of the craftsmen of the Federal Period in America”. Stay tuned next week for more interesting furniture facts you might not yet know! And remember to stop by our showroom or website to see what’s happening in the latest American styles!